When you’ve planned on visiting the Alhambra in Granada for half a lifetime, it doesn’t feel quite real when you’re actually there. Mountains loom on either side as you approach Granada on the motorway, the views increasingly lovely. If you’re there in Spring, as I was, you will probably see snow on the distant peaks of the Sierra Nevada. This is a city which doesn’t know how to disappoint. If you only have a short time for this once in a lifetime experience, you need to be as near to the Alhambra as possible. You could, of course, stay in the parador which lies within the grounds, but I settled for something a little cheaper, but no less exciting- the Hotel Guadeloupe, directly opposite the Alhambra car park, a discount for which is included in the price. After check-in you can saunter across to the Alhambra ticket office to easily collect those tickets which you have already booked on line. From there it’s a simple stroll downhill into town. Something for which I was quite unprepared was the scale of the hills on which Granada sits. Passing immense castle walls you arrive down at the Plaza Real. In Spring sunshine you can follow the River Darro, with all of the Albaicin district still to explore, unbelieving that you are looking up at the mighty Alhambra Palace, poised on the clifftop. 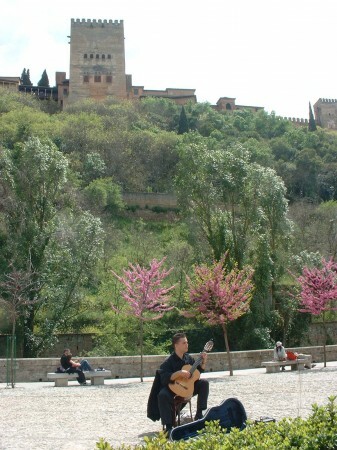 To sit by the banks of the river, beneath pink blossom trees, with a flamenco guitarist serenading as I look up at the Alhambra is a memory that will stay with me for ever. Wine and strawberries complete the picture. It’s a slow steep climb through the atmospheric streets of the Albaicin to the viewing point at the Mirador de San Nicholas, though you can always cheat and catch the minibus. 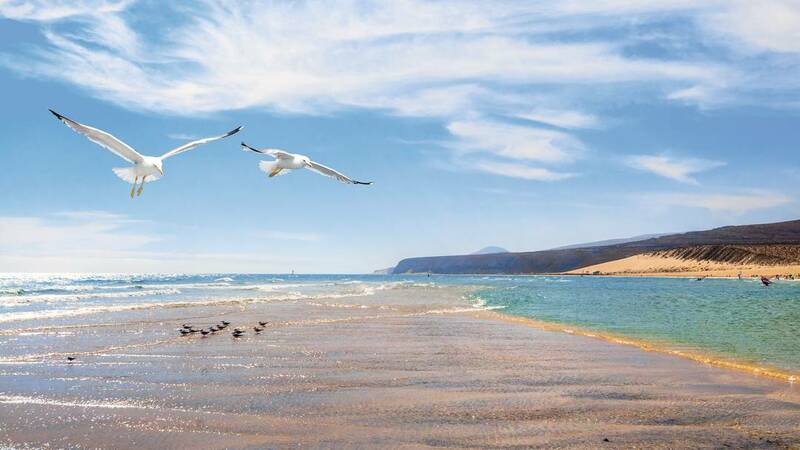 The narrow winding streets reveal carmenes, the traditional houses, tiny shops, restaurants and churches. Las Estrellas restaurant is the perfect reward for your efforts in this most romantic of settings. 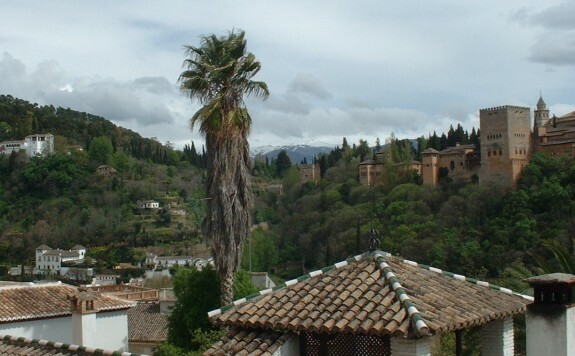 (Callejon Atarazana Vieja 1, tel 958 288 739) Looking across you can see the hills of Sacromonte with its cave dwellings, as well as the whole wonderful panorama of the Alhambra. Sunset is believed to be the best time of day for photographs from this point. Back down in the historic centre the must see sights are the cathedral, and in particular Capilla Real (Royal Chapel). The glittering surroundings befit the tombs of King Ferdinand and Isabella, exquisitely carved from Carrara marble. They commissioned the construction of the chapel in 1504 but died before its completion. Their bodies rested in the convent of San Francisco in the grounds of the Alhambra (now the parador mentioned earlier) before moving to their proper home in 1521. 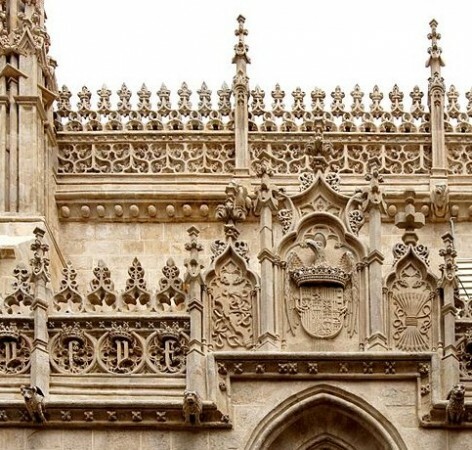 The cathedral is a Gothic extravaganza, celebrating the Christian victory over the Moors, dominant in the Iberian peninsula from 711. Another way to see the sights is on one of the red Granada Tour buses. 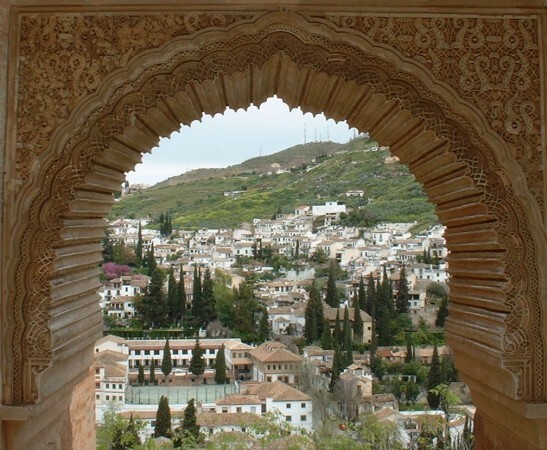 You can purchase a hop-on, hop-off ticket which will do all the legwork for you, including the trip up to the Alhambra. In my case I was very grateful for the minibus which scoots you rapidly back to the heights. The more adventurous might want to take a tour of the city by Segway. Does it live up to expectations? I’d looked at it from every angle but I had butterflies in my stomache when I finally came to view it. 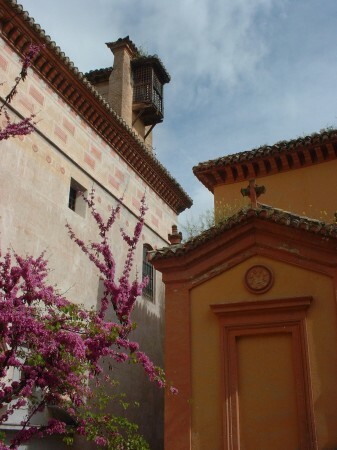 A timed slot is allocated for the centrepiece, the Nasrid Palace. Once inside you can spend as long as you want but you must not miss your entry time. No matter how early you arrive it is inevitable that you will queue at some point but nothing detracts from the beauty and splendour. The Alcazaba is the fortress built in the 11th century to protect the walled city on its lofty plateau, the beginnings of Granada as we know it today. In 1238, with the arrival of Mohammed 1 ibn Nasr, the Nasrids began the longest lasting Muslim dynasty on the Iberian peninsula. The Reconquista was already in full swing in the rest of Spain, but the Nasrids allied themselves with Castile to enable the creation of the Emirate of Granada. They provided mercenaries and gold from North Africa and the palace complex thrived. Cordoba fell to the Christians in 1236 and Sevilla in 1248, but Granada survived until 1492. 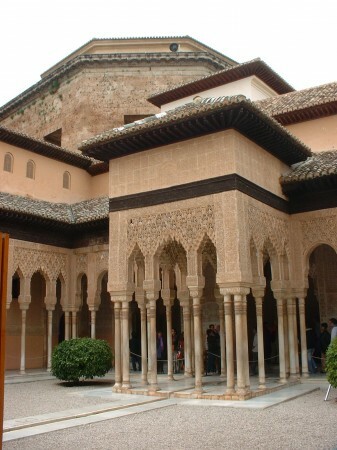 The Nasrid Palace is an architectural triumph. The drama heightens as you pass through the Patio of the Lions, divided by 4 streams of water symbolising Paradise. The intrecacies of the Mudejar patterns take your breath away. Mosaics line room after room until you are speechless looking up at the ceiling of the Sala de los Abencerrages. As you gaze from the terraces you can’t help but conclude that this was a palace fit for kings, yet there’s more to come. The Generalife is one of the oldest surviving Moorish gardens. 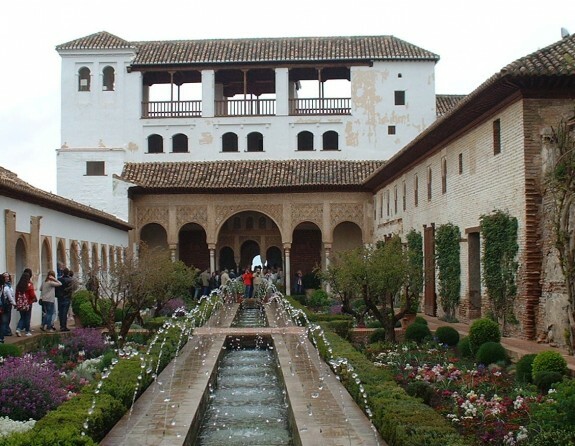 The Courtyard of the Water Garden is certainly one of the most recognisable images of the Alhambra complex. 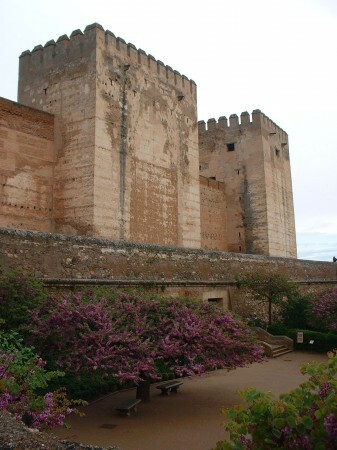 There’s also Carlos V’s Palace, a solid Renaissance style building now housing the museum of the Alhambra. 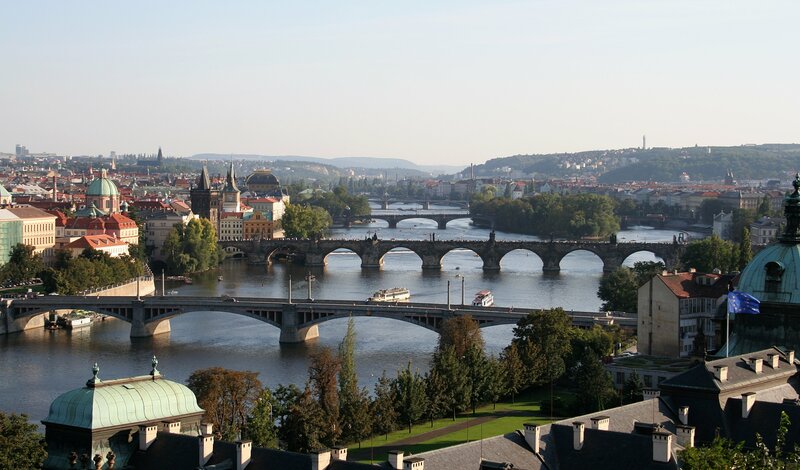 I wandered the grounds marvelling at this most iconic of UNESCO World Heritage sites. A dream fulfilled. Of course, there’s more to see. The gypsy dwellings of Sacromonte are the home of flamenco, and modern Granada has plenty of shops, bars and restaurants. But for me Granada IS the Alhambra. I’ve already written about Sevilla and Cordoba, their architecture and history inseparable from that of Granada. Come with me on my journey.